An upgraded and downsized version of the company's original Monument pedal. Walrus Audio has announced its new Monument Harmonic Tap Tremolo V2 pedal. An upgraded and downsized version of the company's original Monument pedal, which was launched in 2017, the pedal features the ability to use the expression jack for setting external tempo or providing expression control over rate, depth, shape or tap multiplier, improved tremolo response across all rates and top-mounted jacks. Like the original though, the new Monument also features selectable harmonic or standard tremolo, five wave shapes and four tap divisions. 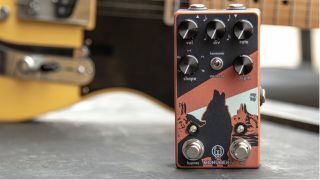 The Walrus Audio Monument Harmonic Tap Tremolo V2 pedal is available now for $199. For more info, head on over to walrusaudio.com.